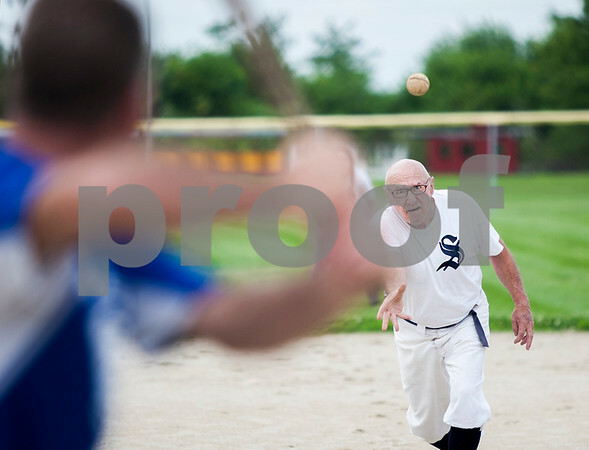 Somonauk Blue Stockings hurler Mike "Ace" Andian, 68, of Somonauk, releases an underhand pitch to a striker from the Waterman 9 team they faced during the Waterman Lions Summerfest and Antique Tractor Show on Saturday, July 18, 2015. Andian started the vintage baseball team in 2006 and the team follows a set of unified rules agreed upon in 1858, one of the earliest set of national rules put in use. The Somonauk Blue Stockings beat the Waterman 9, 6-5.